New documents have been unveiled at the second Apple versus Samsung patent trial. 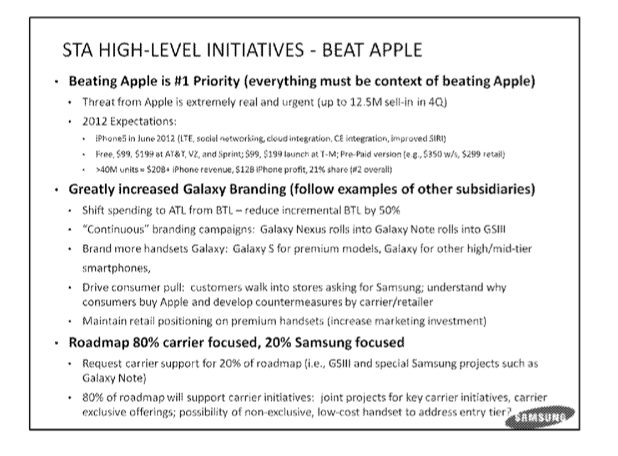 The 2011 Summary & Lessons Learned / 2012 Business Forecast reveals that the top priority for Samsung was beating Apple. As a result everything must be context of beating Apple, according to the recently released documents. Samsungs presentation called the threat from Apple extremely real and urgent. Rather than focus on technology, however, Samsung decided to defeat Apple through continuous branding campaigns. Apple and Samsung are back in court for yet another trial in San Jose, Calif. Two years ago, another trial resulted in Apple being awarded $1 billion when Samsung was found guilty of copying some of Cupertino’s hardware designs. This time around, Apple has accused Samsung of ripping off mobile device features for which they have been granted patents. Re/Code’sLiz Gannesposted the document above along with five others in her post,The Six Juiciest Documents From the Apple-Samsung Trial This Week.